In an asteroid belt near Jupiter, there is a minor planet named Elizamcnitt. 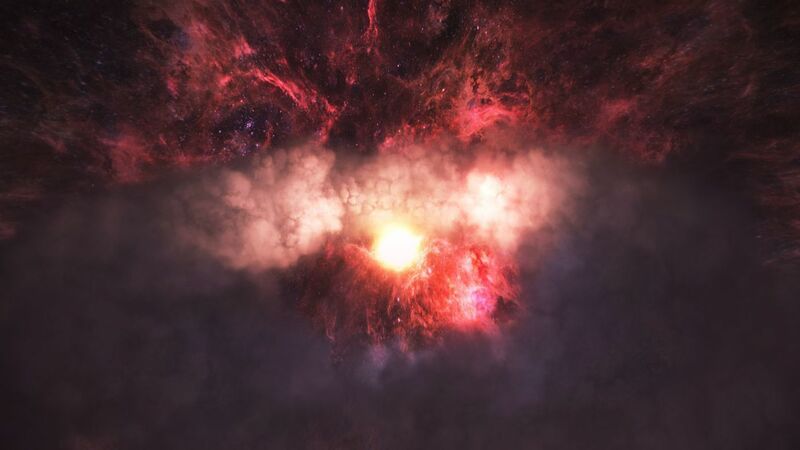 Its namesake is Eliza McNitt, a 26-year-old filmmaker making her Sundance debut this week with the 13-minute virtual-reality experience "Spheres: Songs of Spacetime," which plunges participants into a cosmic collision of two black holes. The planet was named for McNitt as a prize in the Intel International Science and Engineering Fair in high school for her research on honeybee colony collapse disorder. Since then she has forged a career illuminating the humanity that dances at the intersection of art and science via a series of films and VR experiences that have won film festival acclaim. Landing in the New Frontier category at Sundance, however, takes the cake. The exhibition, which features innovations at the forefront of multimedia technology, has a reputation that has risen in tandem with the breakthroughs of virtual reality practitioners each year. It's a fitting place for "Songs of Spacetime," which was executive produced by Darren Aronofsky and Jessica Chastain, who also serves as the voice of the cosmos. Less than a week into the festival, "Spheres" sold in what was called the first seven-figure deal for a VR film to come out of New Frontier. A new VR financing and distribution venture, CityLights, acquired McNitt's project, which eventually will be a three-part series. "My work is about taking you all the way out there in the cosmos so you can look back at our pale blue dot," McNitt says during a recent interview at producer Jess Engel's Echo Park home a few days before the start of Sundance. "I want to create narratives that are about the human connection to science." McNitt's outfit on this rainy morning is a study in negative space: black hat, black leather jacket, black boots and black turtleneck. Her light blond hair provides the only color, along with the flush in her cheeks, as she talks about space, particularly a phenomenon called the Overview Effect, used to define the cognitive shift in perspective that happens when astronauts view our planet from above. "It can also happen to humans on Earth when you have a child or a near-death experience," she says, adjusting the straps on a sleek black pair of Oculus Rift VR goggles that crisscross the globe with her during her frequent work travels. McNitt carries a good-luck charm in her coat pocket on these journeys: a piece of the Atlantis space shuttle that her father, a former aerial marine photographer, gave her for Christmas. "Astronauts are some of the most incredible humans because they have had that experience of looking at the thin blue line of Earth and realizing that it's just that small line that separates us from the darkness of space," she says, handing over the headset and a controller for each hand, and explaining the ways in which "Songs of Spacetime" is a fully interactive experience. Don't be afraid to speak when Chastain's disembodied voice asks you to, McNitt says. Don't be afraid to "move your body like a dancer." When you're asked to reach your arms up, be sure to reach all the way up. 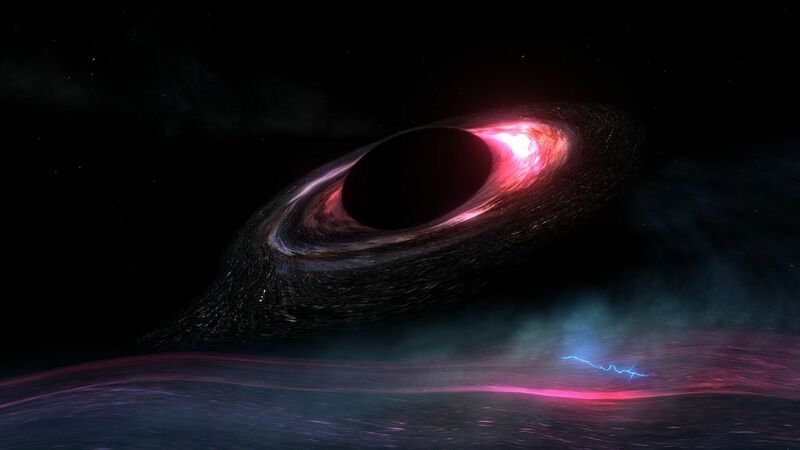 Once inside "Songs of Spacetime," you become a star and fall into the depths of a black hole. Look up as you plunge deeper into the inky depths of the celestial void. A second black hole soars near and you collide — black slanting into blackness. Melt into a process called "spaghettification" as your being is stretched into a thousand threads of light by an extreme gravitational field. Wave your hands and click the controllers to shred yourself to bits. Speak and your voice becomes part of a cosmic choir. Suddenly you are a black hole yourself. The darkness is calm — sublime. You likely will be slightly disoriented when you emerge from the total-body experience. That's because, in keeping with the ever-evolving definition of VR, "Songs of Spacetime" is not exactly a film. It was sculpted inside a gaming engine by a group of artists under McNitt's direction, using the guidance of scientists who did their best to describe what such an occurrence would look like. That description, of course, became theoretical at some point, which was part of the fun for McNitt and her team. "She showed us a prototype for 'Spheres' and it was unlike anything we had seen in VR," says Dylan Golden, a producer with Aronofsky's Protozoa Pictures. Golden first approached McNitt about joining forces with Aronofsky based on their mutual fascination with science. "She was creating this emotional world." Producer Engel says McNitt is making science accessible and artistic. "It doesn't have to be dry or like reading a textbook," Engel says. "You get to experience it in an aesthetic and emotional way." Engel also worked with McNitt on her first VR experience, "Fistful of Stars," which premiered in New York last summer as a part of the staging for "The Hubble Cantata," by classical composer Paola Prestini.From the get-go, Engel knew she wanted to collaborate with McNitt as much as possible going forward." She's very clear with what she wants," Engel says. "She comes at things with a very open mind — with earnestness and sincerity. It makes people want to help her accomplish her vision." Before Engel came onboard, McNitt had already cobbled together an impressive team including Oculus Studios, Aronofsky's Protozoa Pictures, VR-funding platform Kaleidoscope, writer-producer Ari Handel and producer Arnaud Colinart, as well as composers Michael Stein and Kyle Dixon. The pair created the theme music for the Netflix sci-fi show "Stranger Things." McNitt credits her gumption, in part, to what she calls the "McNitt spirit" — a quality passed down from her grandfather, a chemical engineer who attended MIT. "During World War II he was given this choice to work on a top-secret project or to try to figure out how to mass-produce penicillin," she says. "And he thought the top-secret project was probably a bomb — so, 'I'm going to figure out how to save lives rather than take them away,' and he turned down the Manhattan Project." McNitt's earliest memories involve trips to science museums, planetariums and an excavation site for mammoths in North Dakota. When she was 6, her father bought her a microscope for Christmas. She'd catch fish, cut them in half, take off their scales and examine them up close. She was fascinated by how the world worked, and by extension, how it fit into the fabric of space and time. "Songs of Spacetime" is Part 2 of what will be a three-part "Spheres" series being rolled out on a nonlinear timeline. Part 3 will come next, followed by Part 1. The series will be released for Oculus Rift later this year. Taken together, "Spheres" is about the music of space itself. Contrary to popular belief, McNitt says, space is not silent. "In the vastness of space — when you examine what's out there — you hear the sounds of the planets," McNitt says. "The eerie bellows of Saturn and the sound of gravitational waves." The latter emit a noise like a chirp. The sound was discovered in 2015, the result of a black-hole collision that occurred 1.3 billion years ago. That thought broke McNitt's brain, she says. Still, the most unusual sound in the universe, she believes, just might be the sound of the human voice. The next chapter of "Spheres" will explore just that.